An American original, the Bicycle brand celebrates over 130 years of playing card history with the reproduction of the Autocycle #1 card back design printed from 1901-1906. 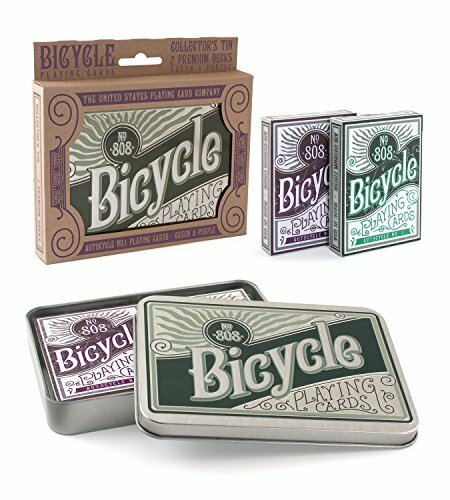 This intricate back design depicts a rider on a motorized bicycle, and the tuck case and tin graphics were inspired by hand-drawn elements from an 1892 Bicycle Juniors deck. Manufacturer: The United States Playing Card Co. Publisher: The United States Playing Card Co. Studio: The United States Playing Card Co. If you have any questions about this product by Bicycle, contact us by completing and submitting the form below. If you are looking for a specif part number, please include it with your message. By US Playing Card Co.